You may notice this week’s post is shorter than usual – some weeks have missing negatives while others are missing entirely. This happens to be one of those weeks, but there was still a lot going on in the years that are covered, from bridge openings to boat building to Brownies meetings. Mayor Pat Carleton waits for a train to arrive outside the Whistler Station. The most photographed bridge on #99! The bridge over the 19 Mile Creek as it was in a nearly finished state last Saturday. The Midstation towers on the new Olympic Chair on Whistler North. Picture taken from the top of the Village Chair. The new Whistler Mountain lapel pin. Do-it-yourself! – Whistler United Pharmacy owner Dave Stewart gives his front windows a polish. LUNCH BREAK! Nello Busdon, Neil Roberts, Pat Greatrex and others enjoy the sunshine in the town centre plaza. Workers lay interlock brick tiles in the Whistler Village Square. Chamber of Commerce’s Michael D’Artois shows off the Town Centre to members of the BCIT Hospitality and Tourism Faculty. Cst. Chuck Klaudt, the new member of the Whistler RCMP detachment. The winners: The Boot Pub Ladies Golf Classic. Dryland downhill training – Dave Murray takes Blackcomb and Whistler Ski Club members through some of the exercises that help limber up skiers for the season opening. The winning team (minus one key player) who put together Whistler’s weekly miracle, the Question, which was judged top in its class by BC and Yukon Community Newspapers Association October 2. Dennis and Judy Waddingham display the new sign painted by Charlie Doyle, which hangs outside their store in Whistler Village. Opening day will be before the mountains begin their season. Whistler’s Brownies rekindled the campfire spirit October 4 when they gathered at Myrtle Philip School for the first meeting of the year. T’is the season to get sawing and chopping. These Alpine residents seem well prepared for winter’s onslaught. A crew of landlubbers helped hoist the deck onto the sleek craft which Cress Walker and Paul Clark have been building all summer long in the driveway of their Alpine Meadows home. Members of the Niels Petersen Band. Niels Petersen (lead vocals), Connie Lebeau (bass guitar), Christopher Allen (harp) and Gary Petersen (drums) warm up an act that will be entertaining Whistlerites all winter. The band will be appearing at Tapley’s and at the Brass Rail throughout the ski season. A cold crisp morning kept most creatures inside early Sunday, but this great blue heron had work to do. It was photographed as it flew over the River of Golden Dreams close to Green Lake looking for fish. Shortly after this photo was taken an industrious beaver swam past carrying wood for its lodge. A smiling Ted Pryce-Jones proudly snips the ribbon to mark the official opening of the new suspension bridge built across the Callaghan River near the Cheakamus River junction last Thursday. Pryce-Jones designed the army-style bridge and with the help of a host of EBAP workers completed the project in under three months. Bridge decking is composed of 3.5m long fir planks treated with a special wood preservative designed to make them last more than 20 years. And for those with bridge phobias, 2 1/2cm steel cables stretch across the river to provide for a safe crossing. Marilyn Manso, one of three employees at the Alta Lake weather station, enters local weather information on a data terminal linked with Toronto. Entries must be made every hour on the hour or more often as changing weather patterns dictate. Posing for photographs can be an awkward process. Surrounded by the steep, rain-drenched Coast Mountains, Whistler and the Sea-to-Sky region is a veritable waterfall watcher’s paradise. 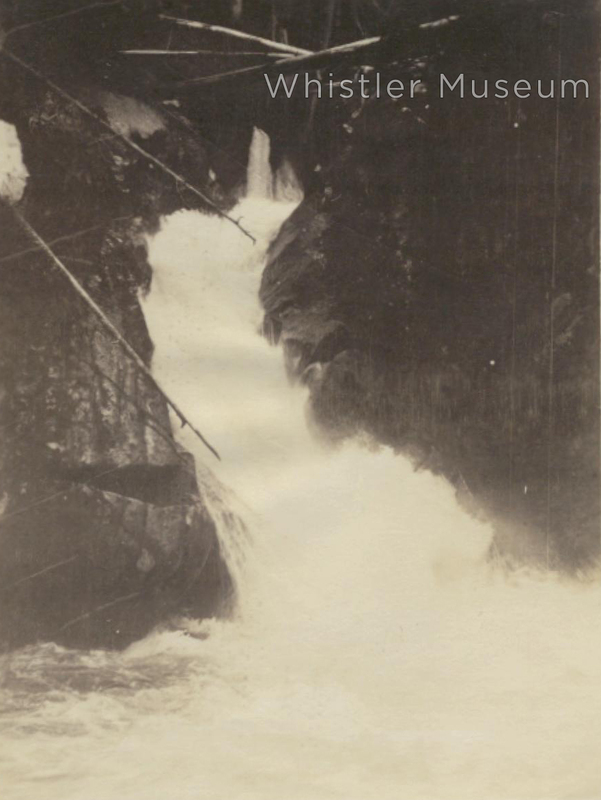 Ever since the early pioneer days, locals and visitors have been drawn to the powerful spray and serene flow of the many cataracts to be discovered. Shannon Falls are arguably the most dramatic and most accessible in the region. Here Alex Philip and friend pay a rather formal visit, circa 1915. 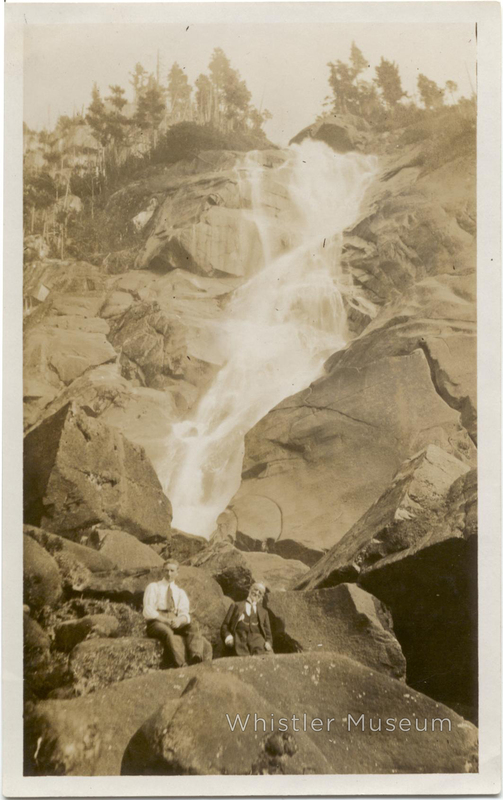 Based on our photo archives, it is clear that Myrtle Philip of Rainbow Lodge fame was especially drawn to waterfalls. 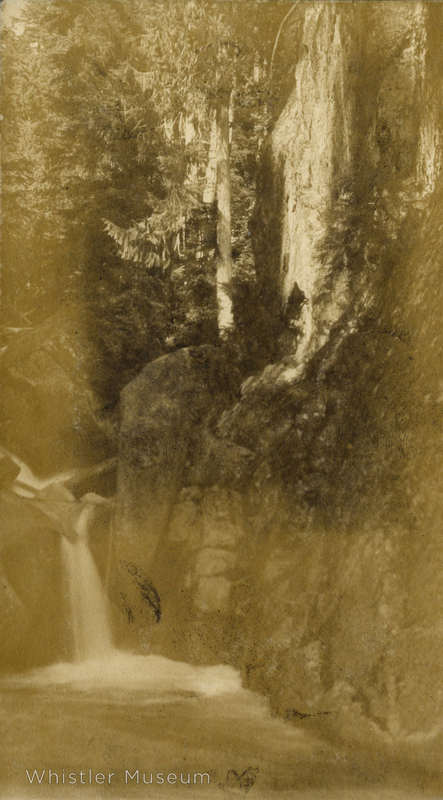 There are dozens of such images in her collection, and they were one of her favourite attractions when guiding lodge guests through the surrounding forest. 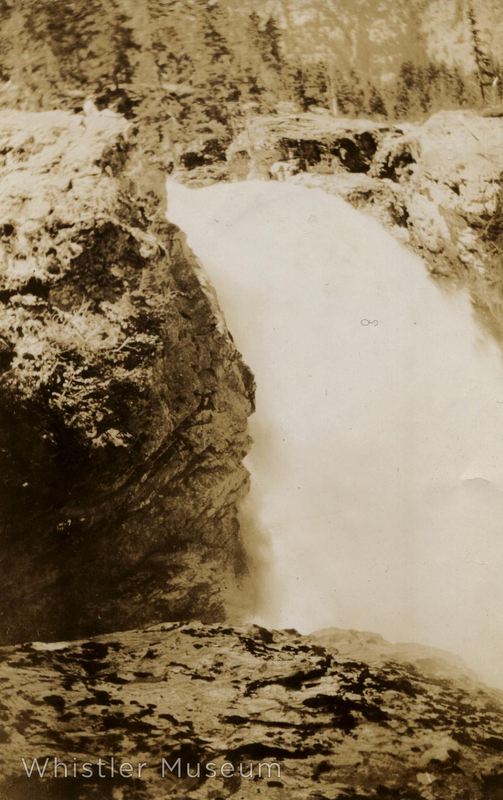 Some of the waterfalls in these photographs we know quite well, while others remain a mystery. 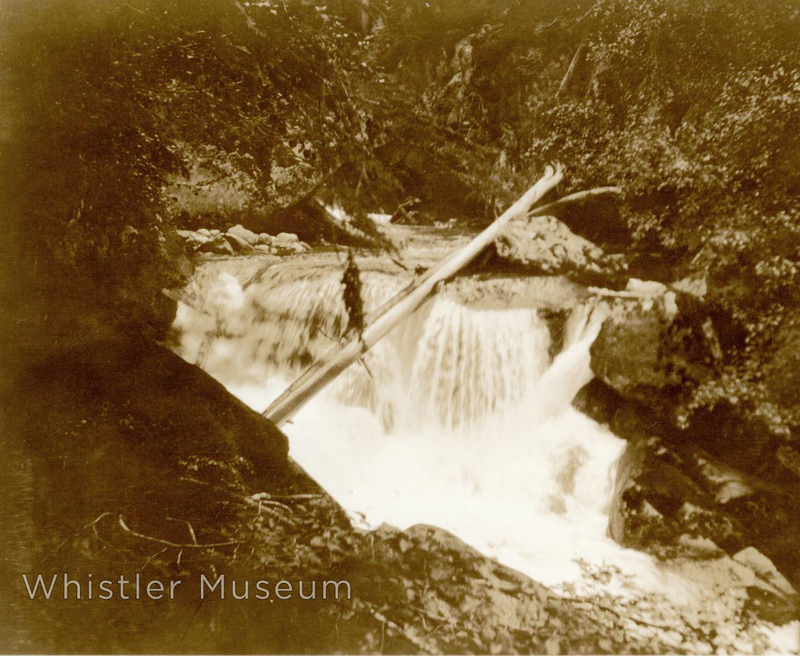 Perhaps some of Whistler’s many waterfall enthusiasts can help us identify them? 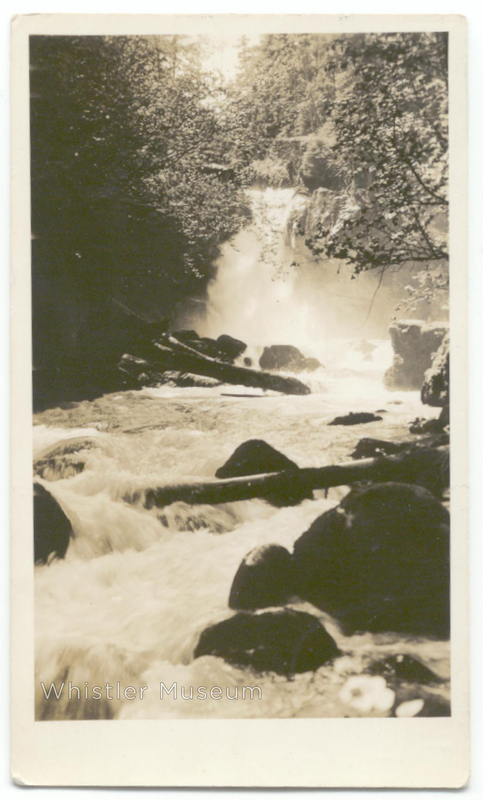 In a recorded interview, Myrtle noted that this photo was “taken when we just began going up there about 1924.” It became a favourite destination for lodge guests on short day hikes from the lodge. Today, 19 Mile Creek runs right through the Alpine Meadows neighbourhood. These are identified as “Rainbow Falls” but it is unclear if they are half of the twin Rainbow Falls that can be seen up close from a short spur trail, low down on the Rainbow Lake trail. This steep cascade in heavy flood is reminiscent of the several creeks that can be seen during the middle section of the Rainbow Lake trail. Any guesses? 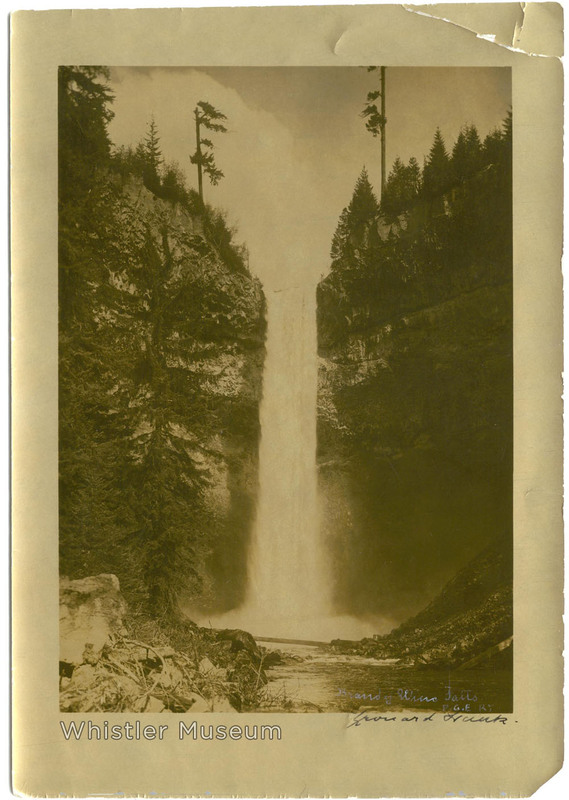 The stunning Brandywine Falls, circa 1920s. 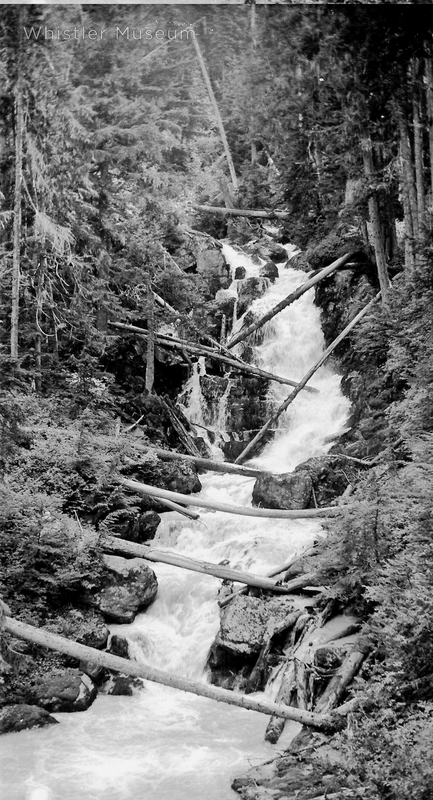 Photo taken by celebrated Vancouver photographer and frequent Rainbow Lodge guest, Lawrence Frank. 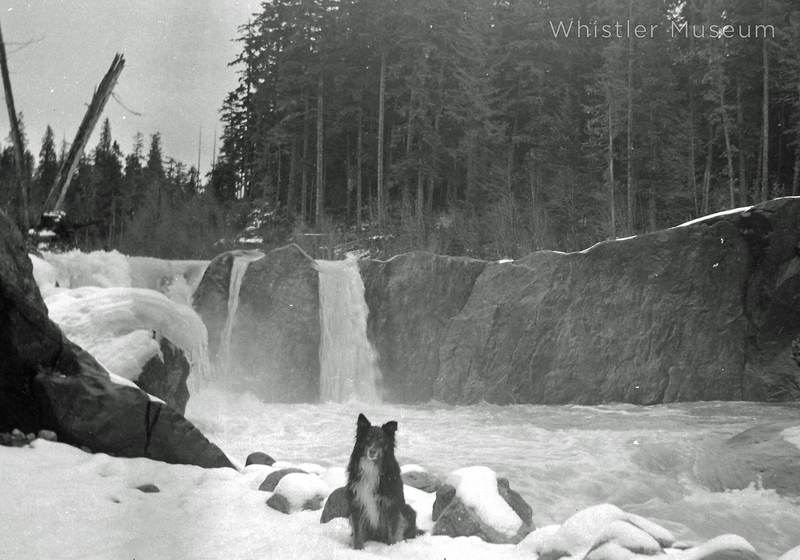 Residents of and visitors to the Cheakamus Crossing neighbourhood should be able to recognize these falls, which provide a stunning winter backdrop for Tweed, the Jardine family’s dog, circa 1930. Most likely somewhere in the Green River canyon. 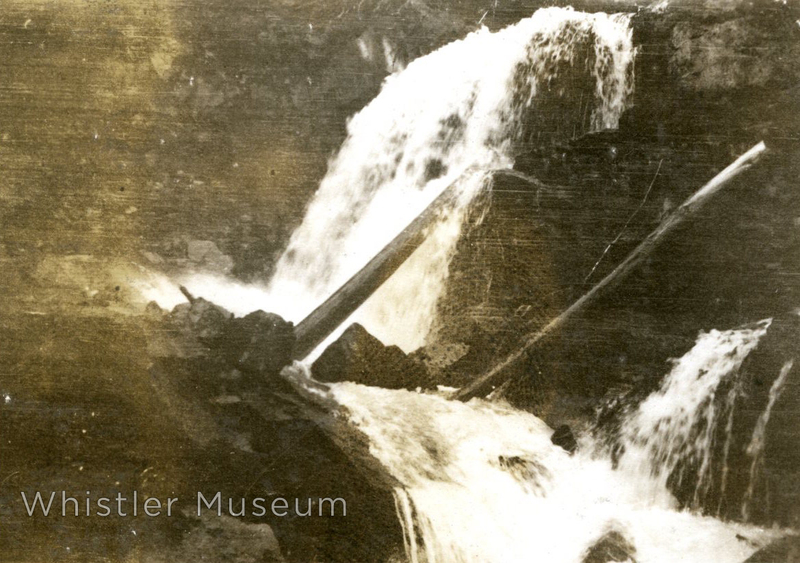 Inscription on the back: “Green River Falls 1918-19.” Taken by Myrtle Philip. Another unidentified gem, shot by Myrtle. This is just a selection of photos, primarily from Myrtle Philip’s collection. 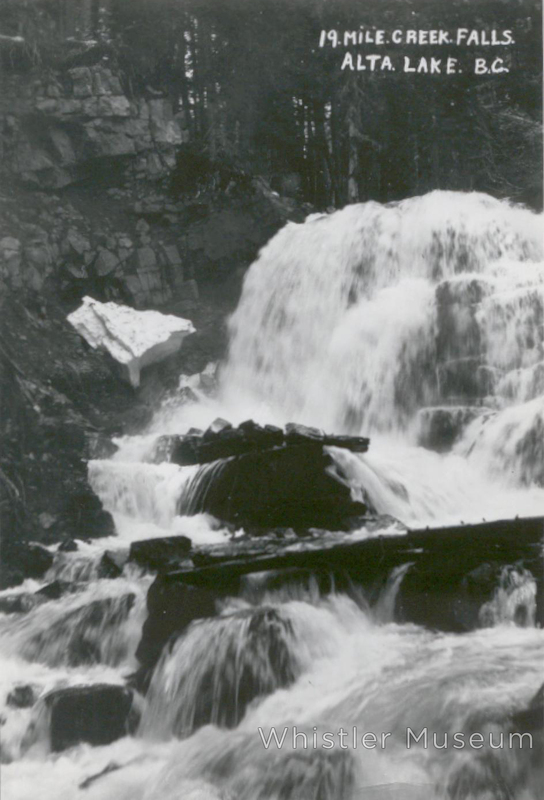 There are many more images of waterfalls in our archives and, of course, many more waterfalls in our region.